The Journey is the Reward. : Happy Birthday Pepperloaf. Today is my little sister's 36th birthday!!! 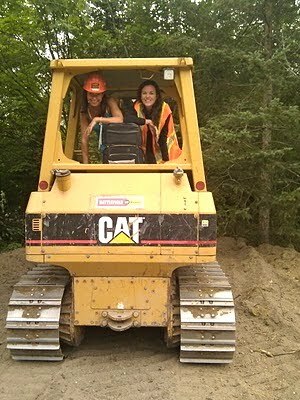 This is a photo taken last July when we were up at the cottage (Jodie on the right). Jodie is flying into London tomorrow at 6am in the morning with gal-pal Al (that's effin' early). Al will be with us until Saturday night and Jodie is staying through until the following Thursday..... Fun, fun, fun!!! 1) I start kettle-bell classes at the gym tomorrow night. Going to be a fantastic week. Can't forget to wish a Happy 4th of July to all of you living down south!!!!!!!! Excited to hear about how your kettle bell classes go! And of course...happy birthday Jodie! Kettle Ball - great!! Are you taking the DrumFit course as well? You two should have a ball. Have fun with your little sister!!! Thanks spacey! Can't wait to see you.....at 6:00am. Tee hee! And kettle bell class sounds wonderful, I heard that is like one of the best types of workouts for runners to do to build strength. Happy Birthday to you sister!! Enjoy kettlebell classes! Kettlebells are a blast. oooh, can't wait to hear about those KB classes! Your LITTLE sister is 36? No way. You look so young!